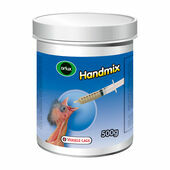 Hand rearing young birds has its own special requirements when it comes to their diets and eating habits. Luckily our hand rearing bird food range for baby birds features products with formulas uniquely geared to those who require greater digestibility and water retention. With mixes that can be mixed with egg and offered as a nesting food for finches, the delicate needs of hand rearing birds are dutifully met with these excellent brands who will help ensure every baby exhibition bird and psittacine (parrot) gets what they need to grow up healthily.